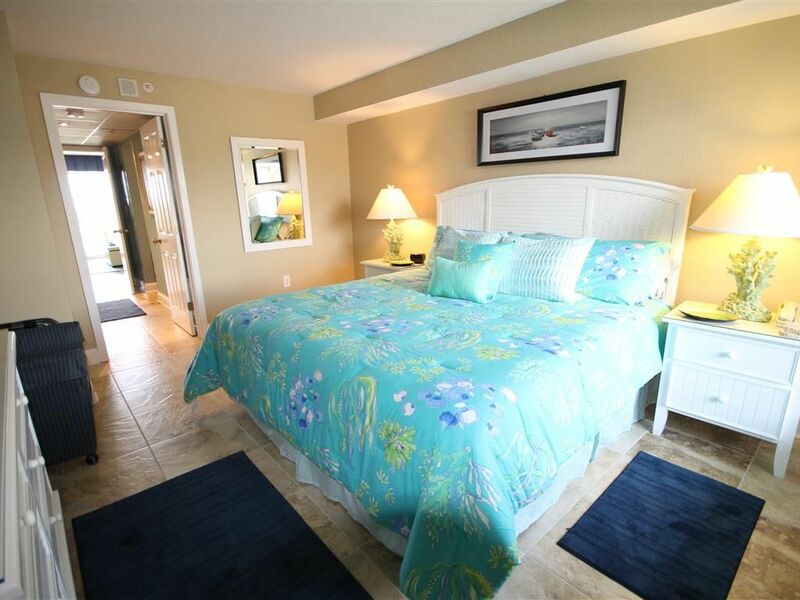 Oceanfront King Bed Suite - Renovated and perfect for a great Vacation! At Boardwalk Beach Resort 133, you can enjoy the view of the beach from your private balcony. This fully renovated unit offers the convenience of a fully equipped kitchen w/crockpot, pots/pans, coffee maker & Keurig coffee maker, toaster, 2 burner cook-top, convection counter-top oven, refrigerator w/ice-maker, silverware & dishes, etc, plus 2 flat screen TVs , 2 DVD players, high speed (wi-fi) internet, tile flooring and oceanfront balcony in a Luxury setting. This Myrtle Beach resort features, 2 pools, both indoor (seasonal) and outdoor pools, indoor (seasonal) and outdoor hot tubs, kiddie pool and more. Have fun trying out some activities on the beach, like surfing, parasailing or kayaking. Afterwards you can venture out and enjoy shopping in boutiques and designer stores. Or you can play a round of golf, go on a deep sea fishing charter, explore the thrills of an amusement park or catch a show at one of the live entertainment theaters. *Please refer to property name when making an inquiry or reservation. We rent to families and responsible adults only. No house parties. No Pets. No Smoking. Weeks only June thru August; Saturday check-in. Minimum Rental Age 25 years. Note: Please note rental rates are subject to change and may increase or decrease depending on availability. Existing reservations with prepayment are excluded. We have been traveling to Myrtle Beach for over 17 years now with our 2 daughters, and their husbands and grandchildren. and just Love the area. We have met new friends in the area and have taken old friends with us on many trips. We love the new memories that we make every trip to the Beach! We chose the Boardwalk Beach Resort because of the proximity to local amenities such as Broadway at the Beach, the Boardwalk, shopping, restaurants and more. Many amenities are within easy walking distance from this resort. The beach is spectacular, there is a lazy river, 2 pools and hot tub. You will love it! Sleep sofa, Chair, 2 ottomans, flat screen TV on wall and DVD player. Fold out table can accommodate up to 4 people. 2 Flat Screen TVs mounted on wall. 4 DVD movies in unit. Great setting, service and overall experience! We had a great time on Myrtle Beach while staying at this property. It was a smooth experience with booking and accessing the property and the service that was provided was awesome. It was as advertised and was in a prime location just a short walk to the beach. I would highly recommend! Thank you for your lovely review. We are glad you had a great time at the beach. We would love to have you return. Perfect view every morning of the sunrise. Very close to beach which is great for walking. Within walking distance of restaurants. Tons of places to see and visit if you have access to a vehicle. Had a concern and called owner who responded quickly. The unit is directly above the swimming pool which could create a noise problem. We stayed in February so the pool was not really in use much. Thanks for the great review. I am glad you had a great trip. We look forward to you visiting again. This condo is so nice! Nice furniture, comfy bed, huge tub and great view! Very convenient to restaurants and bars and close to activities. The condo was stocked with everything you could need. Highly recommend! Thanks for the wonderful review...we strive to make your stay as comfortable as possible. It is great to hear that you enjoyed your stay. Please come visit again. This condo is great! We booked last minute when our other spot cancelled our reservation. Stephen & Charlene got back to us very quickly and everything was great! The condo is great and everything you see on the pictures, the bed is comfortable and the property is clean is well maintained. Steps to the beach, walking distance to several restaurants, bars & attractions. Easy to visit North Myrtle, Surfside, Garden City or Murrells Inlet as well! Would definitely come back!! We go to Myrtle Beach for the World Am every year (12 now) and this was condo and resort wins the top mark! was very clean and up-to date. The condo itself is charming, comfortable, so convenient. Would definitely stay here again. Thank you for the lovely review. We appreciate your feedback. As always we strive to make our unit and your stay as comfortable as possible. We would love to see your return. We stayed here for 2 weeks while we attended the Carolina Country Music Festival. Great place, easy access (once you know which building its in), good parking option, great views of beach, clean facilities and pools and well stocked kitchen! King bed was very comfortable. Close enough to the action on Myrtle Beach without feeling like it was too crazy outside your door. Only thing to mention is wifi is not that great when the building was full on weekends but hey....that was fine. Room wasn’t clean when we arrived due to some confusion with the cleaners but a call to Stephen got the place ready for us in a few hours. Thanks for sharing your place with us. Thanks for the great review. we are glad that you had a great time at the Beach. We try very hard to make your stay as easy and enjoyable as possible. We would love tot see you return. Ripley’s Aquarium, Believe It or Not Museum, Haunted Adventure and 4-D moving theater, ice cream shops, outlet malls, seafood restaurants, water sports, Miniature Golf, Indoor Miniature Golf, championship golf, Casino Boats, shopping, gourmet dining, concerts, live theatre, Dolphin Sighting Cruises, Fishing Charters, freshwater fishing, Family Kingdom amusement park, water parks, museum, fitness center, day spas, jet ski rentals, parasailing, windsurfing, kayaking, biking, shelling, surfing, swimming, Myrtle Beach Pelicans, Broadway at the Beach, Barefoot Landing, Tanger Outlet Centers, Alligator Adventure, Alabama Theatre, Dolly Parton’s Pirates Voyage Fun, Feast and Adventure, Carolina Opry, House of Blues, Medieval Times Dinner & Tournament Show, Le Grande Cirque, Legends in Concert, Banana Boat Rides, Brookgreen Gardens, Huntington State Park, Wonder Works, Myrtle Beach Skywheel, Myrtle Beach Zip Line, Myrtle Beach Speedway Nascar Experience and much more! Rates are subject to 13% sales/accommodations tax plus handling fee. Damage Deposit: Your $250 deposit will be refunded within 3 business days, as long as no damages occur during your stay. If there are, you will be notified and sent an invoice for the repair, and refunded balance. Departure cleaning service and Linens, Room Towel & Beach Towels are included at no additional charge for at least a 3 night stay. Weekly Rentals: During the months of May to September, our weekly rentals are Saturday to Saturday only. Cancellation Policy: Up to 30 days from arrival - 100% refund. within 30 days there is a $125 cancellation fee unless we can re-rent the unit.